Do you know that Facebook is one of the fastest growing ad networks right now? As a matter of fact, the total number of advertisers who make use of Facebook has witnessed a significant increase in the past months, and that’s huge! 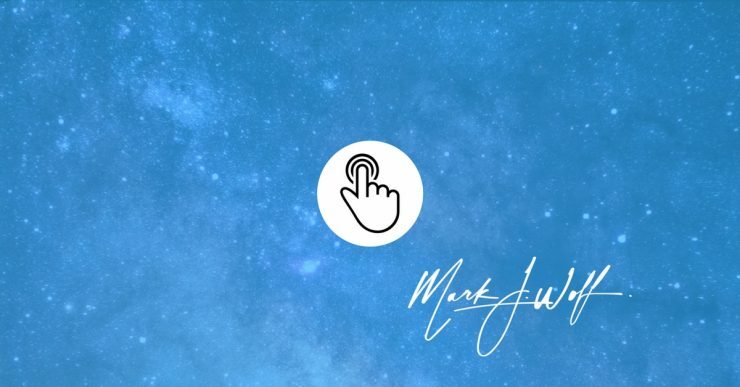 So here’s the big question: have you started advertising on Facebook? If yes, you’re likely to be among the millions of advertisers on the social media platform. Well, that’s great, but I’m pretty sure that getting used to the platform can be a bit challenging. The thing is, Facebook has tons of ad targeting options which can be overwhelming to users. In fact, the performance of these options may differ from client to client. If you’re looking be successful in your ad campaigns, you’ll need to get an idea of the numbers to beat in your respective industry. That’s a whole lot of industries right? Well, it’s time to check out their averages. Let’s get started! 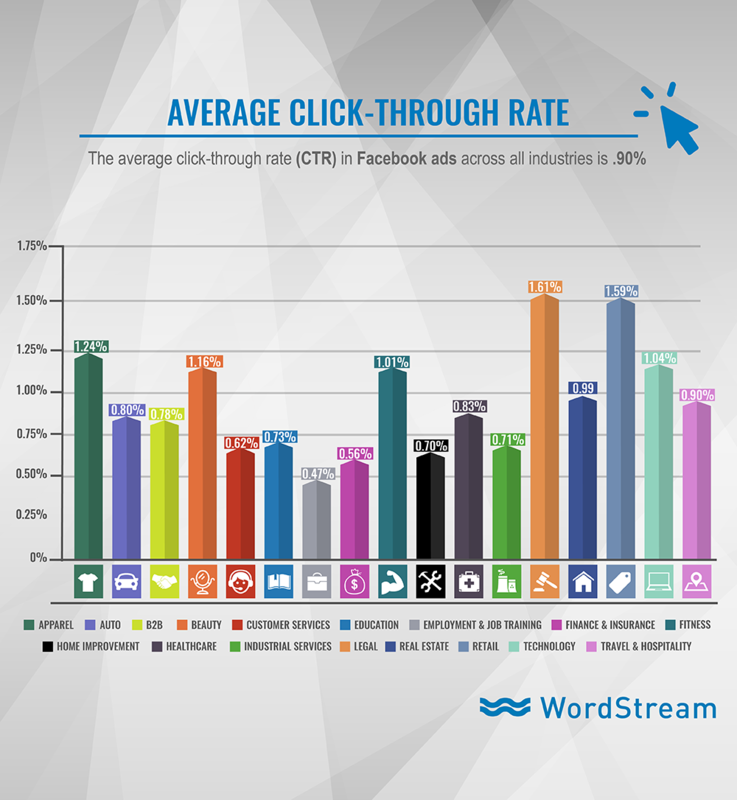 From the chart above you’ll find that legal advertisers have the highest CTRs on Facebook (1.61%). Now, this might not be the case on SERP as they’re very likely to struggle with low click-through rates. Let’s face it; your legal ad won’t be able to impress prospective clients when it’s right in the midst of seven ads on the SERP. The good thing is, a lawyer’s high-value offer coupled with a call to action is sure to catch on when it’s just there on a prospect’s social feed. Besides legal advertisers, there are other ones who happen to have high CTRs. This includes advertisers in the retail (1.59%), apparel (1.24%), beauty (1.16%) and fitness (1.01) industries. If you’re familiar with these industries, you’ll find that they typically feature high-quality photos and models in their ads. And the good thing is, those ads tend to perform excellently on visual platforms like Facebook and Instagram. So what about employment & job training services? Well, these advertisers tend to have pretty low CTRs on Facebook (0.47%). With this average, we can conclude that Facebook and Instagram may not be favorable job seekers — but LinkedIn should bring desired results in no time. Education advertisers are sure to feel good with this one as the average CPA turns out to be $7.85. With this average, we can conclude that Facebook is an excellent spot to get a hold of your new students. However, the platform can be really expensive when it comes to finding a new car, architect or IT specialist. Why? Well, the average Facebook CPAs for auto, home improvement, and technology services are $43.84, $44.6 and $55.21 respectively. The good thing is, the lifetime value of a new client in these industries is encouraging and sure to be worthwhile in the end. 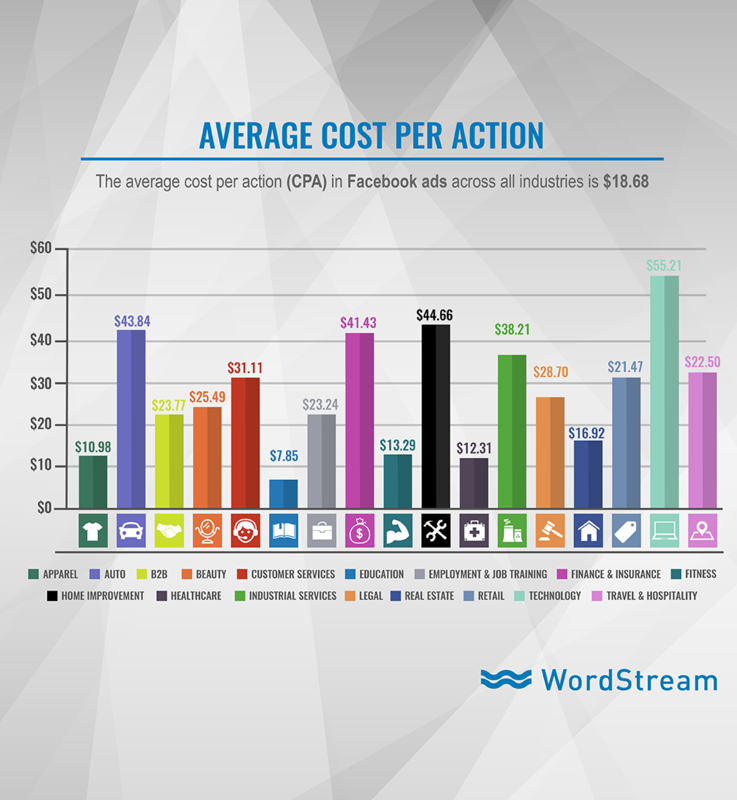 Bottom line: The average Cost Per Action for Facebook ads across all industries is $18.68. 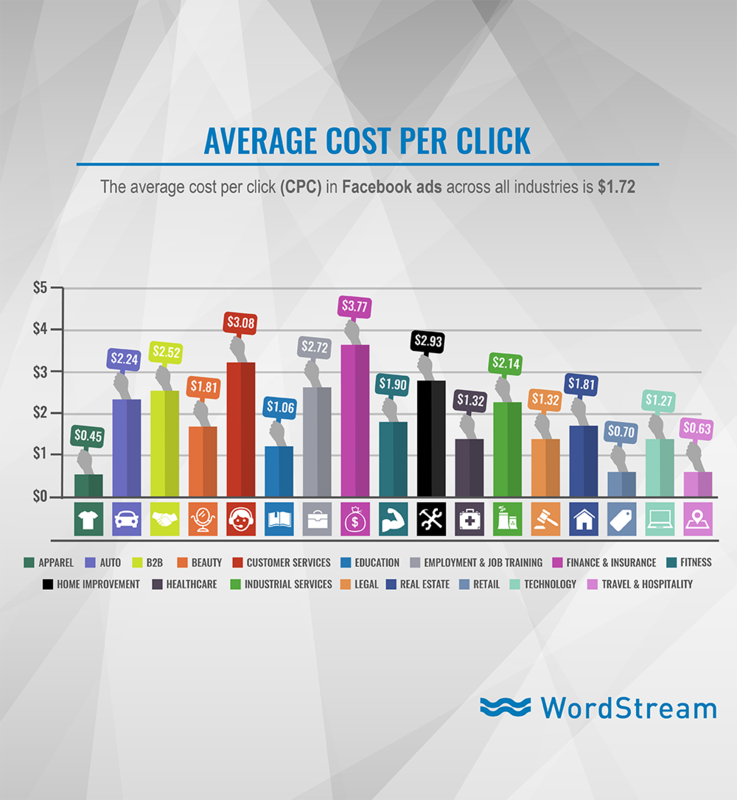 For starters, we can see that financial advertisers boast the highest CPCs on Facebook which is $3.77 per click. It’s also important to note that the terms “Insurance,” “Loans” and “Mortgage” happen to be the three most expensive keywords on Google. Each of those keywords cost $50 per click. If you take a look at the chart above, you’ll find that the cheapest clicks on Facebook fall on the apparel ($0.45 per click), travel and hospitality ($0.63), as well as other retailers ($0.70) industries. One thing to keep in mind is that these industries tend to have huge audiences even at these low CPCs. So you have to learn how to manage your budget so things can go as smoothly as planned. Fitness studios are really having it good with Facebook as they’re sure to find prospects in no time. 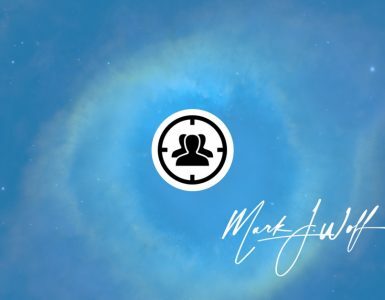 Fitness advertisers can easily connect with driven prospects via Facebook, and they’ll also get to convert at astonishingly high rates. 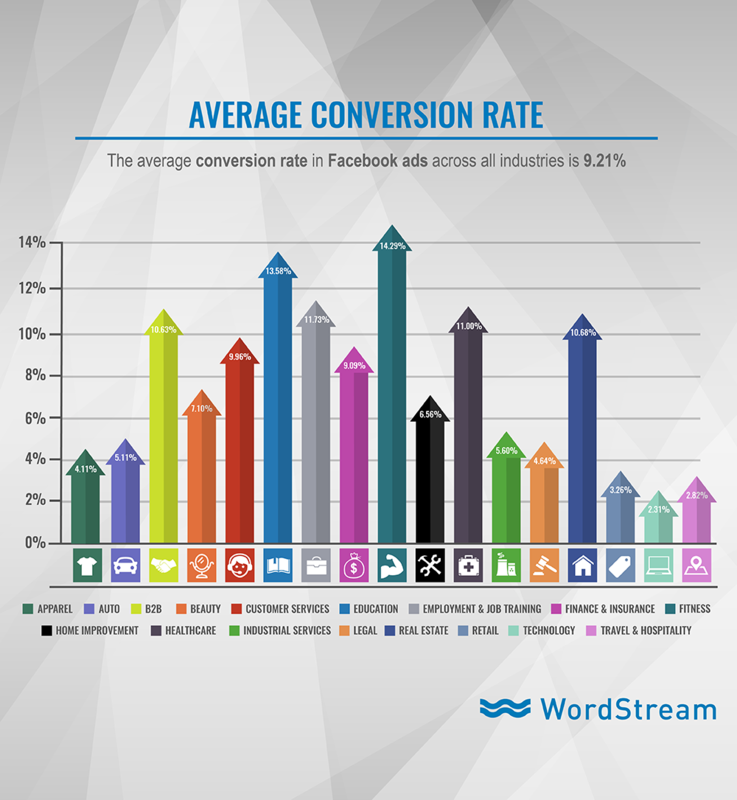 For the most part, Fitness advertisers are sure to get an average of 14.29% conversion rates from Facebook ads. The good thing is, there are still other industries with high conversion rates including education (13.58%), employment & job training (11.73%), healthcare (11.00%), real estate (10.68%) as well as B2B (10.63%). 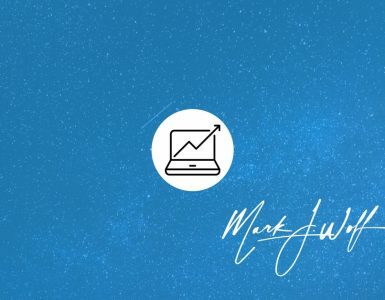 So, advertisers in these industries are also sure to have a good time thanks to Facebook’s unique lead generation ads. So what about other sectors? Well, industries such as retail, travel & hospitality and technology may have a hard time with Facebook’s lead generation ads and are very likely to have low conversion rates. For the most part, retail averages 3.26%, travel & hospitality averages 2.82% while technology is 2.31%. So what can these marketers do? Sticking to the path of remarketing on Facebook can have a significant effect on conversion rates. You should remember that all the stated benchmarks have a lot of different variables. In essence, targeting, creativity, and budget will have a significant effect on how your ad performs. Your ultimate goal should be to create a cost-effective campaign which drives quality traffic to your website that converts. 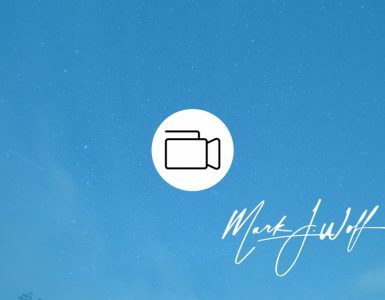 Don’t use too much text: it’s crucial to limit the amount of text you use in your graphics. The excessive use of text can even affect the approval of your ad, and that’s not good for business. Keep your graphics bright and limit the use of custom graphics: The use of high-quality images for your ads cannot be overemphasized. I mean no one would want to engage with blurry or poorly crafted visuals. Moreover, several statistics shows that users are more attracted to ads with images of people opposed to custom graphics. Target Wisely: Ensure that you’re targeting the right audience as doing this will improve the performance of your ads. Be more focused on News Feeds: It’s pretty obvious that there are different placement options at your disposal, but we recommend targeting news feeds. You may not know this, but the Desktop and Mobile News Feeds are sure to provide you with the most cost-effective ads placements. Lastly, always keep your ad copy detailed and easy to understand. Conciseness is key! Well, with all that has been said, we can see that Facebook advertising is no longer an option but a necessity to advertisers. It’s glaringly clear that Facebook offers tons of opportunities to advertisers in just about every industry and that’s huge. So, if you haven’t started leveraging the power of Facebook advertising for your business, I suggest you start now! Moreover, of you’re already there but happen to be on the lower end of these numbers, just keep pushing till you start getting higher. And finally, if you find yourself to be hitting these benchmarks, don’t just settle for the average but keep looking for how to go higher and become the best in the pack.